﻿The Batman gold prospect is part of a goldfield that was worked from early in the 20th century. Gold and tin were discovered in the Mt Todd area in 1889. Most deposits were worked in the period from 1902 to 1914. A total of 7.80 tonnes of tin concentrate was obtained from cassiterite-bearing quartz-kaolin lodes at the Morris and Shamrock mines. The Jones Brothers reef was the most extensively mined gold-bearing quartz vein, with a recorded production of 28.45 kg Au. This reef consists of a steeply dipping ferruginous quartz lode within tightly folded greywackes. The Yinberrie Wolfram field, discovered in 1913, is located 5 km west of Mt Todd. Tungsten, molybdenum and bismuth mineralization was discovered in greisenized aplite dykes and quartz veins in a small stock of the Cullen Batholith. Recorded production from numerous shallow shafts is 163 tonnes of tungsten, 130 kg of molybdenite and a small quantity of bismuth. Exploration for uranium began in the 1950s. Small uranium prospects were discovered in sheared or greisenized portions of the Cullen Batholith in the vicinity of the Edith River. The area has been explored previously by Esso for uranium without any economic success. Australian Ores and Minerals Limited (AOM) in joint venture with Wandaroo Mining Corporation and Esso Standard Oil took out a number of mining leases in the Mt Todd area during 1975. Initial exploration consisted of stream sediment sampling, rock chip sampling, and geological reconnaissance for a variety of commodities. A number of geochemical anomalies were found primarily in the vicinity of old workings. Follow-up work concentrated on alluvial tin and, later, auriferous reefs. Backhoe trenching, costeaning, and ground follow-up were the favored mode of exploration. Two diamond drillholes were drilled at Quigleys. Despite determining that the gold potential of the reefs in the area was promising, AOM ceased work around Mt Todd. The Arafura Mining Corporation, CRA Exploration, and Marriaz Pty Ltd all explored the Mt Todd area at different times between 1975 and 1983. 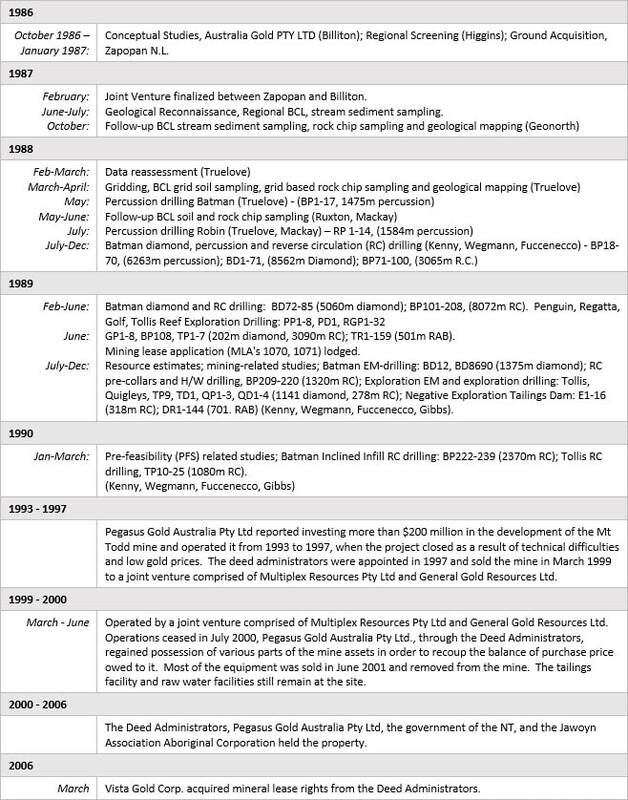 In late 1981, CRA Exploration conducted grid surveys, geological mapping and a 14-diamond drillhole program, with an aggregate meterage of 676.5 m, to test the gold content of Quigleys Reef over a strike length of 800 m. Following this program CRA Exploration did not proceed with further exploration. During late 1986, Pacific Gold Mines NL (Pacific Gold Mines) undertook exploration in the area which resulted in small-scale open cut mining on the Quigleys and Golf reefs, and limited test mining at the Alpha, Bravo, Charlie and Delta pits. Ore was carted to a carbon-in-pulp (CIP) plant owned by Pacific Gold Mines at Moline. This continued until December 1987. Pacific Gold Mines ceased operations in the area in February 1988 having produced approximately 86,000 tonnes grading 4 g-Au/t (historic reported production, not NI 43-101 compliant). Subsequent negotiations between the Mt Todd Joint Venture partners (Billiton and Zapopan) and Pacific Gold Mines resulted in the acquisition of this ground and incorporation into the joint venture.